In my books, there are only 2 ways to roast a leg of lamb - with a hint of pink so it's juicy (30 minutes per kg/2lb) or cooked loooooong and slow until tender. Anything in between = dry, tough meat. 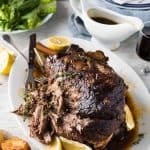 This recipe is the Greek way of roasting lamb - slow roasted until tender, braised in a lemon garlic thyme broth that reduces down to a sauce. The sauce is completely different to the thick gravy you are probably used to. This sauce is not thickened with flour, it is lemony, herby and garlicky so it cuts through the richness of the lamb. This is easier and far more foolproof than traditional roast leg of lamb because you don't need to worry about overcooking it. Use a small knife to make around 25 incisions all over the lamb, with most on the top. Cut around 6 cloves into slivers and stuff them into the incisions. Sprinkle the lamb generously all over with salt, pepper, paprika and garlic powder. Drizzle with olive oil and rub all over the lamb. Place the lamb in a roasting pan and roast for 30 minutes or until it has a nice brown crust. Remove from the oven. Turn the oven down to 160C/320F (fan forced) / 180C/350F (conventional). Turn the lamb upside down. Pour / place all the remaining ingredients in the pan around the lamb (including remaining garlic cloves). Fill the roasting pan with hot water so it comes up about 1/4 - 1/3 of the way up the height of the lamb. Remove the roast from the oven and remove the lid/foil. Turn the lamb over so it is the right side up. Cover again and roast for a further 2 1/2 hours, or until you can pull meat apart with forks. Remove from the oven and transfer lamb to serving platter. Cover loosely with foil and rest for 30 - 40 minutes. Strain liquid into a clear jug. The fat will rise to the top. Scoop/pour most of it off - I get 3/4 - 1 cup. There should be 2 - 3 cups of Sauce left. Adjust salt, pepper and lemon to taste. Serve lamb with the Sauce on the side and Truly Crunchy Roast Potatoes (heat oil while lamb is in the oven, then cook potatoes when the lamb is resting). 1. I used a full leg of lamb which is too long for most roasting trays. If you buy it from a supermarket, typically the shaft (bone) will be cut so it bends so it can fit into the pan. If you purchase it from a butcher, ask them to do this for you because you need the roast to fit flat in a roasting pan so it can lie submerged in the braising liquid. 2. Or as high as your oven goes if it can't go this high. 4. Adapted from this Slow Roasted Leg of Lamb by Kalofagas.